Published Jan 22, 2016 by Pearson IT Certification. Part of the LiveLessons series. To browse all A+ product offering, exam profiles, career resources, and more go to our CompTIA A+ Resource Center. 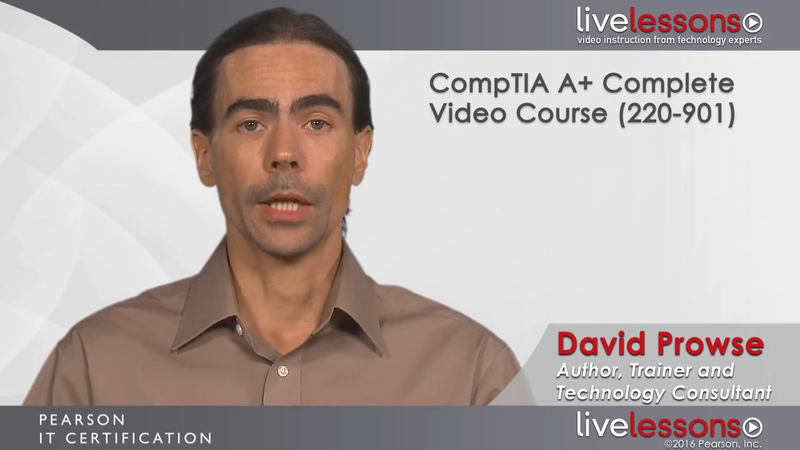 More than 21 hours of video training covering all of the objectives in the CompTIA A+ 220-901 exam with practice questions, exercises and simulations. 4 practice quizzes (with 100 practice exam questions). These questions come with remediation and references to video lessons. More than 20 interactive hardware, OS, and networking simulations to help you practice for the performance-based exercises on the exam. 20 interactive hands-on exercises to help you retain knowledge. Match definitions for resolution, color depth, refresh rate, etc. 13.1: What is a Computer Network? 13.2: What are the Reasons for having a Computer Network? Match mobile devices to their respective characteristics. This video deals with the four main types of printers—laser, inkjet, impact, and thermal—but focuses on the laser printer. It demonstrates how to configure printers and share them with other computers.